"One of the Best Kept Secrets in Downtown Napa." Welcome to Cedar Gables Inn! 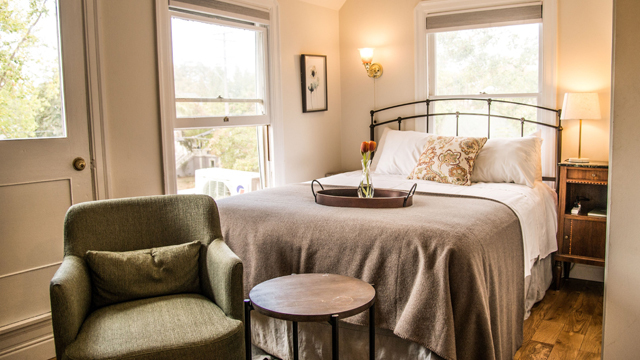 You can book direct at our Downtown Napa Bed & Breakfast and take advantage of our lowest rates and latest availability. Take a look at any of our 9 exquisitely designed boutique rooms and book your Napa stay today! Explore our nine exquisitely designed rooms that provide charming accommodations, each with its own unique charm, for your next romantic Napa bed and breakfast getaway. Book directly right here on our official and get the lowest rates online at our Napa Valley Inn. Interested in holding a meeting or wedding at our 10,000 sq. ft. Mansion? 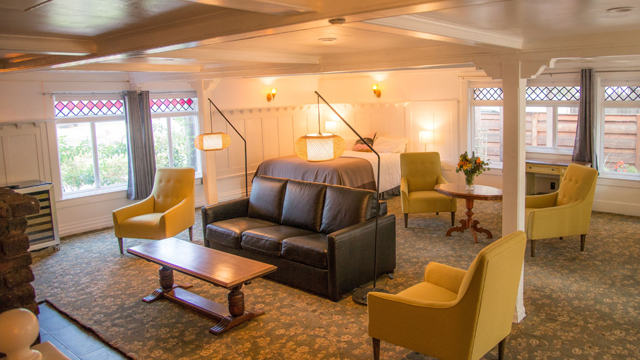 Let Cedar Gables Inn be your host while visiting Napa Valley. 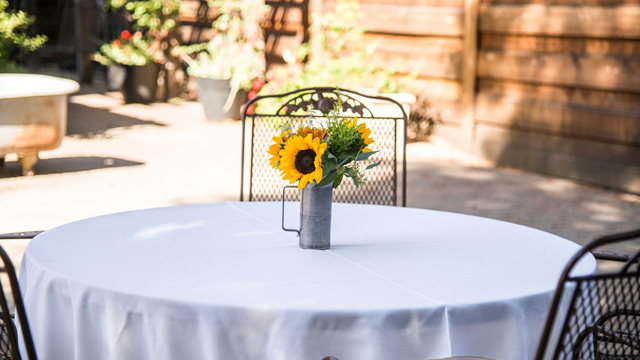 The Majestic Cedar Gables Inn resides perfectly at 486 Coombs Street between Randolph and Brown Street in beautiful Downtown Napa just a short two-minute stroll from the Napa River and walking distance to many shops, fine restaurants, and wine tasting rooms. 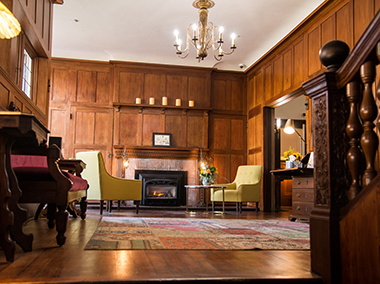 Staying at Cedar Gables offers an unparalleled Napa Experience where you can enjoy the best of Downtown Napa without driving. As one of America’s grand Arts & Crafts mansions, the historic 10,000 square foot Cedar Gables Inn is perhaps the most unique Inn manse in Napa County. Eclectic and rebellious was the nexus of the Arts & Crafts Movement, which emerged in the early 1800s as a throwback to emphasize more hand craftsmanship and design to contrast the technological forces of the Industrial Revolution. This Arts & Crafts artistic movement is replicated in the experience you will have with your stay at The Cedar Gables Inn; Escape the hustle and bustle of today’s high tech bombardment of bits and bytes, and come and experience a return to more simpler times where you can cast away the stresses of everyday life and find reprieve over a glass of Napa Valley Wine amongst new friends, while being surrounded by the rich décor and ambiance of our historic Napa Inn. Built by the famous English architect Ernest Coxhead, one of three top architects in San Francisco, in 1892 in the Arts & Crafts Style, this resplendent architectural masterpiece is an elegant 4-star Inn that is ideal for hosting grand parties, elegant social gatherings, holiday parties, or executive retreats. 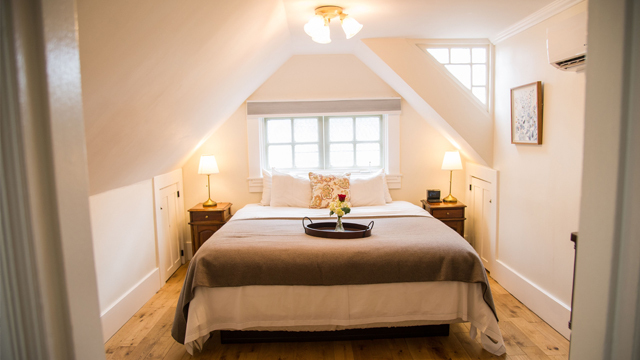 Best of all, Cedar Gables offers a romantic Napa retreat for couples. So you can enjoy a peaceful stay in solitude or enjoy the lost art of conversation and revel in Old-World elegance while you treat yourself to an unforgettable experience. Indulge in delicious gourmet breakfasts. 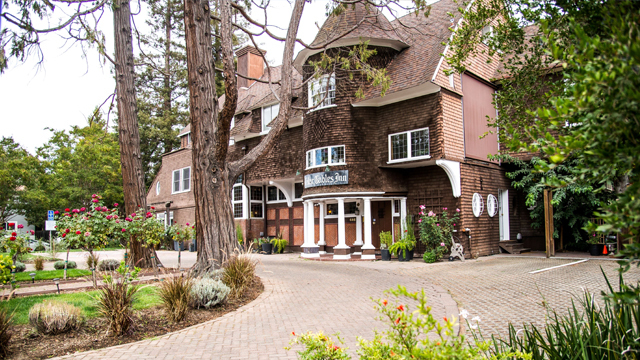 Once you come upon The Cedar Gables Inn in Old Town Napa, you will be presented with an impressive structure built with coastal redwood and adorned with wooden shingles that climb the turrets and gabled roof punctuated by leaded glass windows and colorful mosaic inlays. Cedar Gables was originally a wedding present from Edward S. Churchill to his son in 1892. One of the ‘Big Four’ mansions in Napa, The Cedar Gables has been home to many over the past century. Eventually sold by Churchill’s daughter, Dorothy, to Ella Balmer, the building was converted into a 33-room boarding house in the 1930s. The Cedar Gables Inn sign over the front door is a memento nearly a century old as it was originally put up by Ella. The home again exchanged hands when a local doctor purchased the property for his practice. Then during World War II, the mansion housed military nurses. 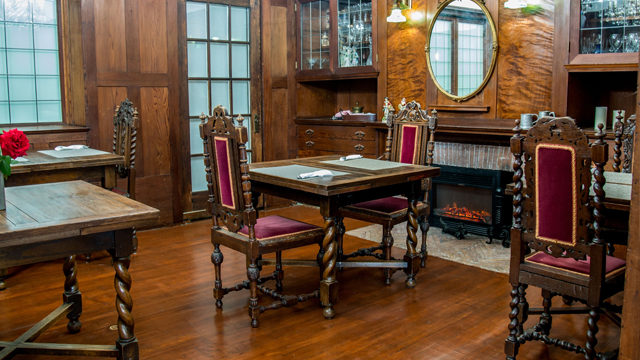 Converted back to a single family home, then a high-class ladies spa, and now an Inn, Cedar Gables Inn has been painstakingly restored over the past decade. 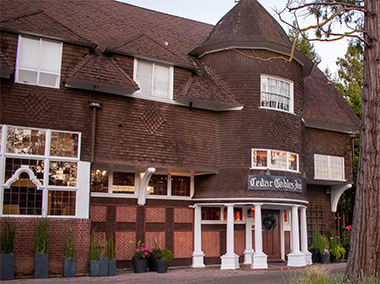 Cedar Gables Inn is a stored building that belongs to Napa’s history and is earnestly shared with the public. In classic Arts & Crafts style, the open planned interior is shaped by a color palette that reflects the natural environment and consists of an ornate wood paneled foyer that leads to living space and formal dining room. Lose yourself in the charming spaces throughout the property with sunny bay windows and seating areas bathed in nuanced lighting where you can enjoy some quiet solitude with your favorite novel. Winding staircases lead to our 9 beautifully adorned guestrooms. Each of the nine deluxe 100% smoke-free guestrooms and suites at The Cedar Gables Inn boasts handsomely appointed, magnificent decor and a restful color pallet in a celebration of romance that is sure to delight your senses. All of our guestrooms are ADA Defined service-animal friendly. You will find our guest rooms are filled with unique decorative and fine arts, and each living space in our mansion offers a rich and memorable experience. 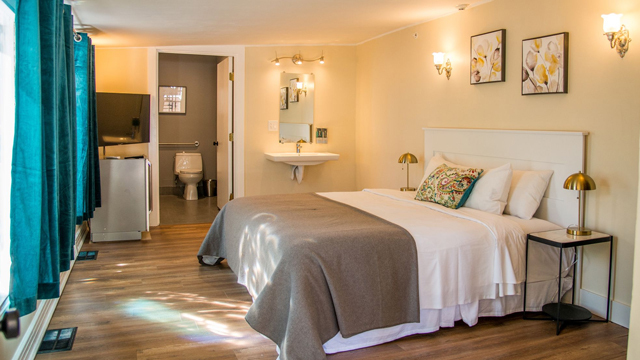 Guests of Cedar Gables Inn will enjoy signature in-room amenities such as plush bathrobes, complimentary bottled water, sodas, snacks, and William Roam's luxury bath products. We invite you to select any one of our 7 king rooms or 2 queen petite rooms and allow yourself to be pampered as only Cedar Gables Inn can. All rooms feature private bathrooms with make-up and shaving mirrors and blow dryers. 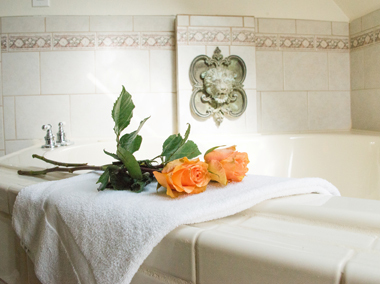 Select rooms are equipped with a soaking tub or hot tub; in addition, select rooms have a fireplace. Roll-Away Beds and sleeper sofas are available only for select rooms (Count Bonzi and Lady Margaret Suite), and extra persons and extra beds must be approved by the innkeeper prior to arrival (extra charges may apply), up to 2 extra person is allowed per room (Count Bonzi and Lady Margaret Suite). Cedar Gables Inn offers additional extras at an additional charge allowing you to pamper yourself, or someone you love, with beautiful flowers, premium chocolates, a special occasion cakes, LED candles, cheese and fruit platters, and a superior selection of wine and champagne. Please contact us for pricing and availability. 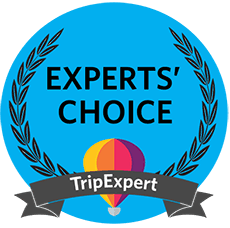 Learn more about our five-star TripAdvisor Rated Downtown Napa Inn here.